Here are my 6 Unusual Headboard Ideas. I love a good headboard. It creates a real focal point for a bedroom. 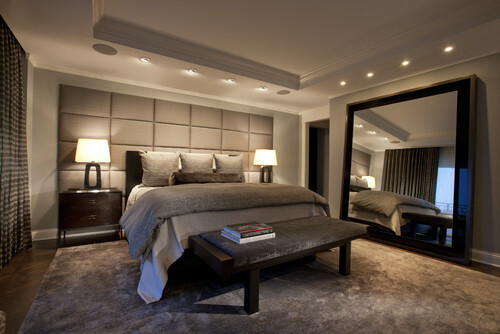 They can be very dramatic by having the headboard reach the ceiling to something a little less simple. They can be functional or just for decorative purposes such as canopy headboards. An upholstered headboard adds sophistication and glamour to a bedroom. If you are after the Boutique Hotel look, then this is the headboard for you. Wooden Panel Headboard is a perfect choice to make a statement if you are on a budget and like a bit of DIY. A canopy headboard can give a room a romantic boho feel. I particularly like this style in children’s bedrooms. Again, a cheap but effective alternative. Using a rug as a headboard gives the room a focal point. This look is great for boho, moroccon style bedrooms. These can either be tacked to the wall or you can use a curtain pole to hang the rug behind the bed. You can easily make these headboards yourself, by cutting out pieces of MDF to the sizes you would like, gluing foam to the MDF and then stapling with a staple gun, some fabric around the MDF. I think these make a real statement and can be made in neutral or bold fabrics. The grand finale if you are feeling very brave and wanting something with the Wow factor is an artwork headboard. If you didn’t want to commit to wallpapering your wall you could always have a freestanding headboard using a large piece of MDF and wallpaper it using a mural wallpaper. There are loads of choice on line for mural wallpapers which are fantastic. Or if you are quite arty you could design your own mural and have that as your headboard. Murals Wallpaper have so much choice. Here are just a few of my favourites. If you enjoy reading my Blog, please sign up to my Newsletter where you will receive Interior Design Tips and Advice only to my Newsletter subscribers.